When you first installed your wood deck, you couldn’t believe just how beautiful it looked and are thinking back to how much use it would get in the evenings and weekends. Now, you’re trying to remember the last time you actually stepped onto your deck and can’t remember when you fired-up the grill last. Needless to say, if you’ve not regularly using your wood deck, it’s being neglected by default. Sure, you’d love to restore the deck but are apprehensive about tackling such a big project on your own. Fortunately, it doesn’t take a lot of specialized skills or tools to refinish a stained wood deck. You’ll only need a few supplies and tools, as well as a helping hand or two to get the job done right and look great. 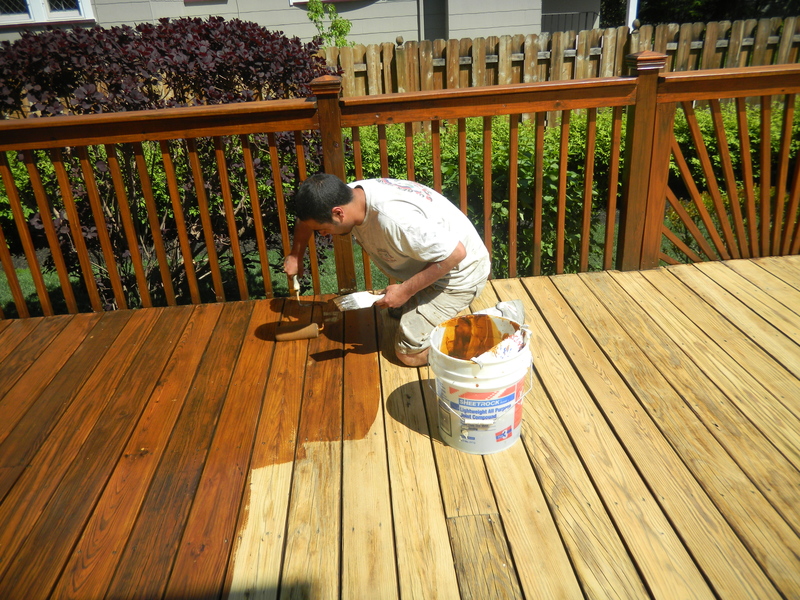 Before you refinish your deck, you’re probably thinking it’s time for some changes. Perhaps you don’t like the furniture or decor and just want a change for something different. Whatever the case, there are ways to improve your deck and remake it into an outdoor oasis that’s ideal for relaxing and entertaining friends and family. For instance, you can clean it up, refinish the stain and then replace the furniture. You can also hang a swing to give it a rustic look and provide a place to relax. In addition, you might consider putting in a fire pit that doubles as a table for guests to gather around and eat. You might even replace the grill or can install deck lighting to make it really attractive. To get the best results, you’ll have to use the right materials, supplies, and tools. Otherwise, it won’t look as good as it could and will have to be completely redone. The trick is to take your time and go step-by-step. If you rush through the process, you’re likely to miss something and the results will certainly show. Clear off the entire deck. Remove everything from your deck, no matter how small it is. It’s especially important to clear it off so you can inspect the entire deck for any damage or things in need of repair. Make any necessary repairs. You’ll probably find a screw or nail or two that’s sticking out from the wood. Use a drill-driver or hammer to refasten screws and nails. If these are corroded, then replace them. Should boards be warped, replace these with new planks. Clean the surface thoroughly. Use deck wash, a garden hose, and scrub brush to clean the whole surface thoroughly. Make sure the entire surface is clean and then let it dry for a day. Sand the whole surface of your deck. Now, you need to sand off the old finish. While stain will not peel like paint, it will fade and you need a new surface to apply another coat or more of stain. Don’t go crazy, just sand off most of the existing stain. Clean the deck off again and allow to dry. Clean the deck again to get rid of all the dust and debris, then, allow it to dry. You’ll probably have to broom it off once more before staining the wood. Apply as many coats of stain as necessary. Using a brush, roller, paint tray, and stain, apply the first coat to the wood. Let it dry completely and do not step on the surface until the first coat is dry. Then, apply one or two more coats of stain to complete the refinish. Once the last coat is dry, you can put the furniture and any decor back onto the surface — be careful not to mar or scratch the wood. The stain will last about five years if you periodically clean the deck.